Tim Hooper, our Music Director, was born in Bournemouth in 1964, where his love of classical music began after being introduced to Brahms 1st Symphony whilst at junior school. When in the sixth-form at Bournemouth School, he won an organ scholarship to St. Edmund Hall, Oxford, to study music. His passion for conducting started with his first public concert at the age of fourteen. This led to becoming the orchestral conductor of the local student group, Gli Amici Della Musica in 1983. Whilst at Oxford he conducted the Oxford Sinfonietta, as well as a number of college choral societies. 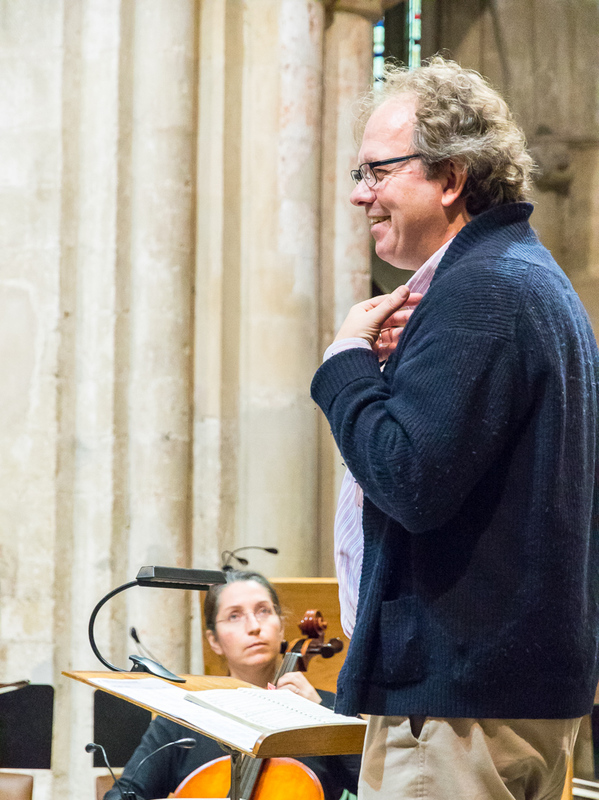 Since Oxford Tim has worked with the Rockbourne Singers, Grange Choral Society, Milton Abbey Music Festival, Dorset Youth Orchestra and Sinfonia, Cambridge Music Festival and various ensembles at Goldsmiths College, including the Sinfonia, Chorus and OperaGold. 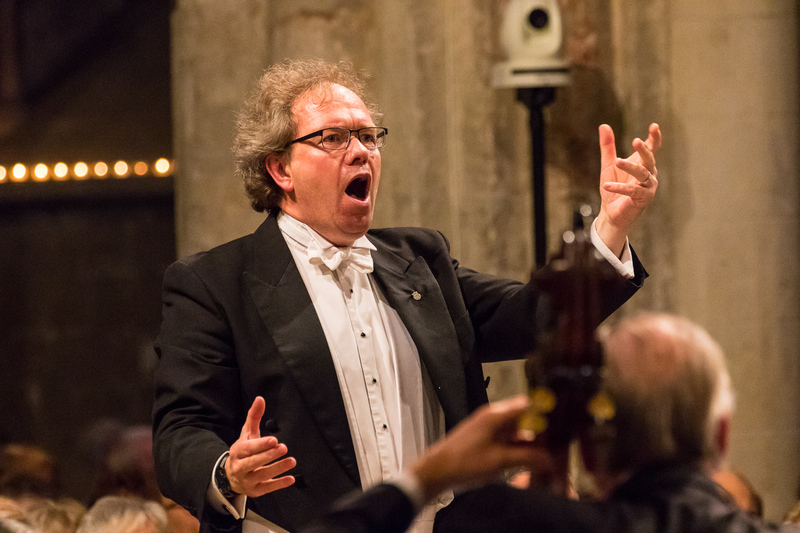 He has conducted in many exciting venues, including The Sheldonian Theatre (Oxford), Bournemouth Winter Gardens, Ely Cathedral, St David’s Hall (Cardiff) and many times at his favourite ecclesiastical building, Christchurch Priory. His varied symphonic repertoire has included Mahler Symphony No.2 Resurrection and Symphonies 5 and 10, Beethoven Symphonies 5, 7 and 9 Choral, Elgar Enigma Variations, Brahms Symphony No. 1, Mendelssohn Symphony No. 2 Hymn of Praise and numerous symphonies by Haydn and Mozart. Tim’s choral repertoire has included all the major works of his beloved J.S. Bach, Beethoven Missa Solemnis, Britten War Requiem, Elgar The Dream of Gerontius and The Kingdom, Walton Belshazzar’s Feast, Berlioz Te Deum, Mendelssohn Elijah, Brahms A German Requiem, Tippett A Child of Our Time, Vaughan Williams A Sea Symphony, Verdi Requiem and over thirty performances of Handel Messiah. Operas he has conducted include Bizet Carmen, Britten Peter Grimes, Verdi Rigoletto and Puccini La Bohème. Tim has been the Musical Director of Bournemouth Bach Choir since 1992. He is also currently the conductor/Musical Director of Hutton and Shenfield Choral Society, City Chamber Choir and Chamber Orchestra (University of London) and Cardiff University Symphony Chorus.